This arrangement features a mix of white lilies, carnations and miniature carnations with vibrant greens in a large basket. The Peaceful White Lilies assortment measures about 26" W x 25" H and is a lovely gesture to someone who's feeling down or has recently lost someone near and dear to their heart. Here is a link to the product page on Bloomex.ca. 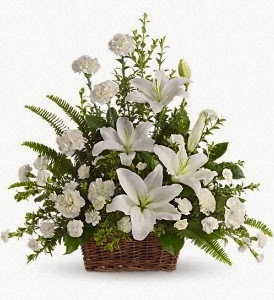 This lovely basket of Lilies makes for an ideal basket to send in times of sympathy and mourning.